Snippets of Jack: "I hate that monkey!" Look to the right. What do you see? Our awesome new poll! So go click on your favorite Pirates of the Caribbean pet. And if you want to share with us why, then please comment below! In the meantime, I'm going to try to influence your vote by sharing my favorite and why. 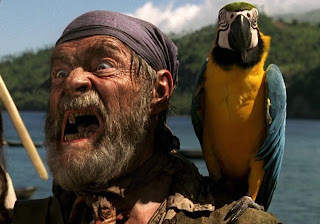 Cotton joins Jack Sparrow's crew at the beginning of The Pirates of the Caribbean: Curse of the Black Pearl when Gibbs rounds up a crew for Jack and sticks around though the next three movies, always remaining loyal to Jack. At least, we think so because he's never said otherwise. Of course, that's because he doesn't have a tongue (got it chopped out for leaking a secret round Tortuga). But instead of using sign language, he trains his parrot to talk for him. So when Jack asks Cotton to join his crew, he has to assume that "Wind in the sails" translates to "yes". He says a lot of other pirate-y phrases like "Dead men tell no tales" and "walk the plank". I totally would love to have a pirate parrot. It seems like every young adventerous boy grows up with a loving dog! Well, Jack Sparrow is no exception. Raised by the Keeper of the Code, Jack grew pretty fond of the scruffy dog who kept track of the keys. But this dog seems to make quite a few appearances outside of Jack's childhood. He's the prison dog at Fort Charles Prison in Port Royal, Jamaica, where Jack runs into him again and calls him some very not nice things. But then Pintel and Ragetti bust out of that jail with the help of the dog and take him to the Isla de Pelegostos. The canibals there decide the dog is a god (maybe because the two words are eachother backwards! ), so they start to worship him. Just when we think we've seen the last of him, he returns back to his original home! He's at Shipwreck Cove, guarding the keys of the Pirate Code for Captain Teague again. This is just mind boggling to the silly pirates (then again, so is everything else). So is it just the same dog, over and over again who is just transported around the world by sea turtles or is it just that all pirates love a dog like him? The world will never know . . . I don't mean to be insulting to our lovely Captain Jack Sparrow, but I do love this little undead monkey. Actually, I more love how much everybody hates him. He pretty much runs around the deck doing Barbossa's will in the first movie. 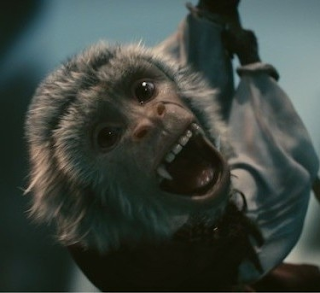 But once Barbossa is dead, Jack the monkey is free to roam the Pearl being an abnoxious little pest. Jack however, loves to shoot the undead monkey, which has got to be fun. They decide to get rid of him by locking him in a cage and giving him to Tia Dalma. But of course, she just lets him out the second she gets him. Just a little counterproductive. And then Hector Barbossa comes back to life and he and his precious little monkey sidekick make more trouble for Jack and the crew. But wait, there's more! That little monkey finally gets what he deserves when Blackbeard shrinks the little pest into a bottle, where his is trapped until Gibbs and Jack can find a goat. Hmmm, hopefully there will be another pet in the next movie! Baaaaaaaa! Hey, I just saw this post. Fantastic as always! Thanks so much! That means a lot to us!